We are back in the busy world of full-on gardening after what seems like a long, damp and difficult winter. How blissful! As I get busy in the garden again, spending long hours out in the wind and the sun – weeding, planting and watering, – I seem to be re-acquainting myself with some very old friends indeed. Why many of these are plants that have travelled with me from garden to garden, and a lot of them have been given to us by some of our dearest family and friends! You see many of the plants that I grow in this Seaview garden are plants that I have grown in other places, at other times. They are cuttings and rootings that I lovingly potted up and transplanted when we came here. There they sat, against the wall, in the wind and snow and cold of our first winter, waiting for us to start work on the garden in the spring. 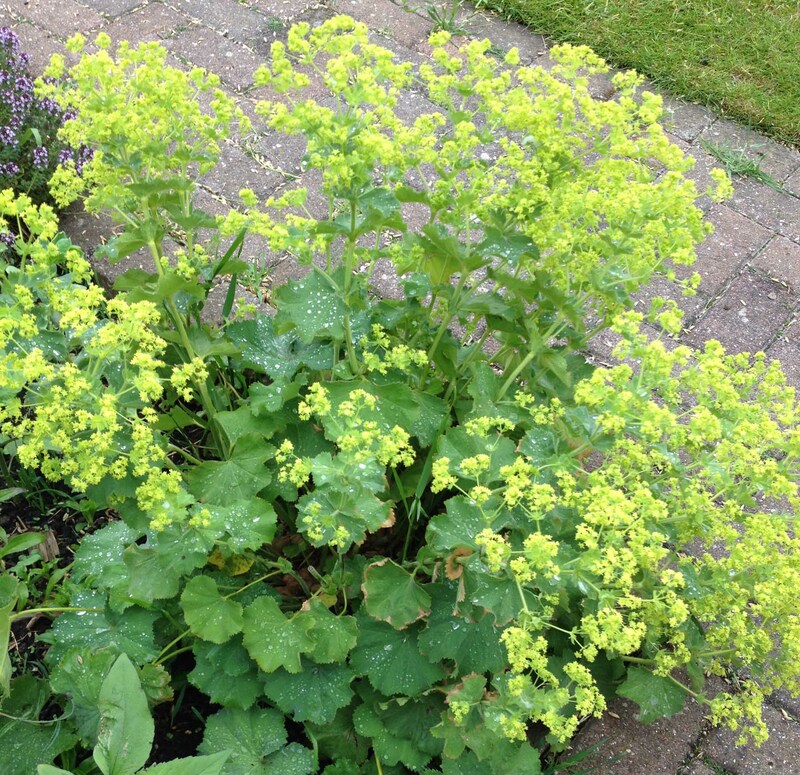 Take, for example, the alchemilla mollis (also known by its very charming colloquial name of Lady’s Mantle) – one of my very favourite cottage garden plants. Here it is in our Northumbrian garden: And here it is – edging another path – in the little Devon garden we used to have. 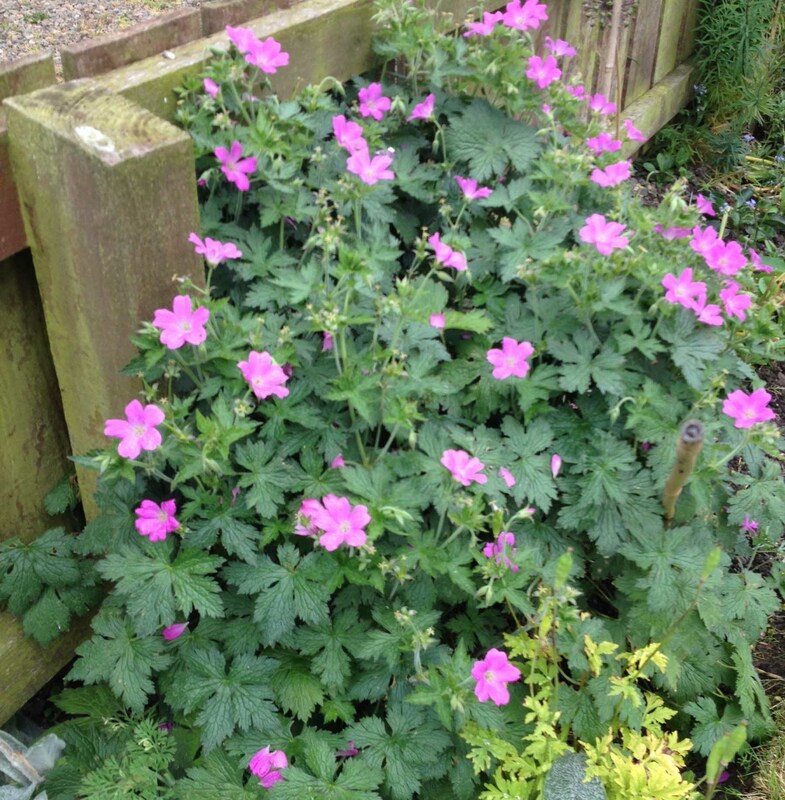 In our Seaview garden, the wild pink geranium is just about flowering. 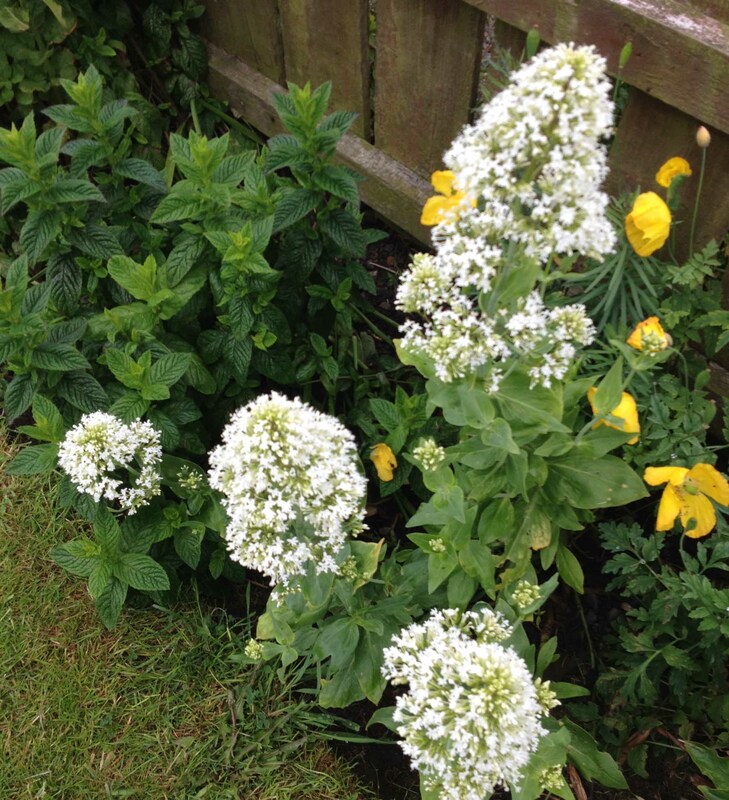 The white valerian is now out. 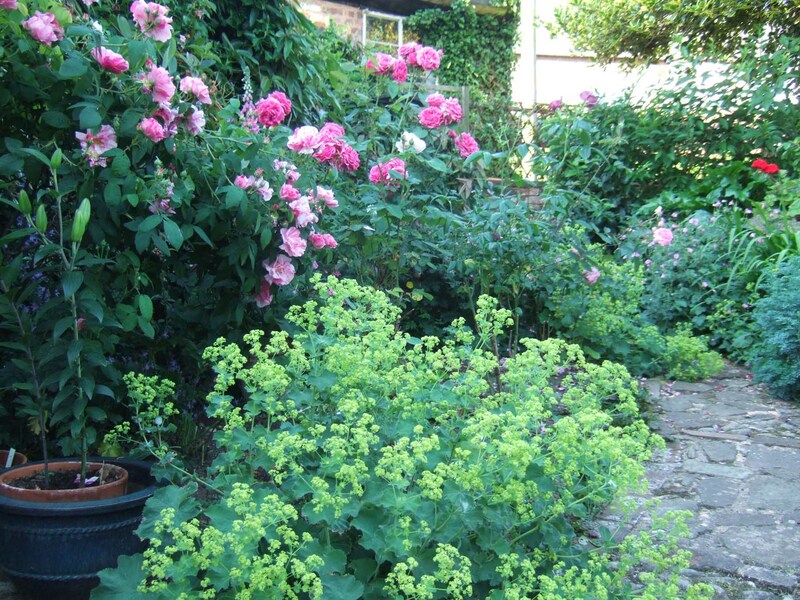 Those too flourished in our Devon garden (the valerian on the right, and the geranium on the left). Here in Northumberland, the Lamb’s Ear plants are doing well – they particularly love our seaside climate. 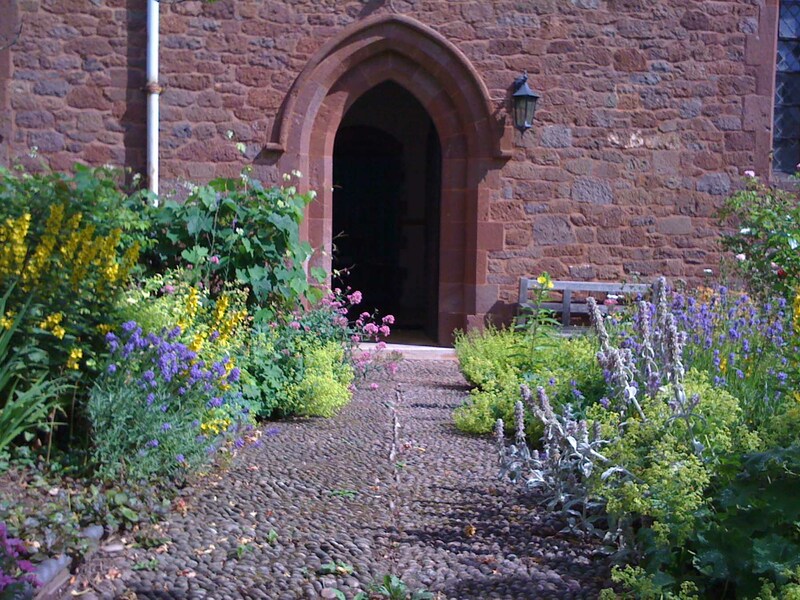 As well as the small garden of our terraced Crediton home, we also looked after the garden of the nearby mediaeval chapel of St Lawrence. There are the parent plants of our Seaview Lamb’s Ear plants (as well as lots more Alchemilla). 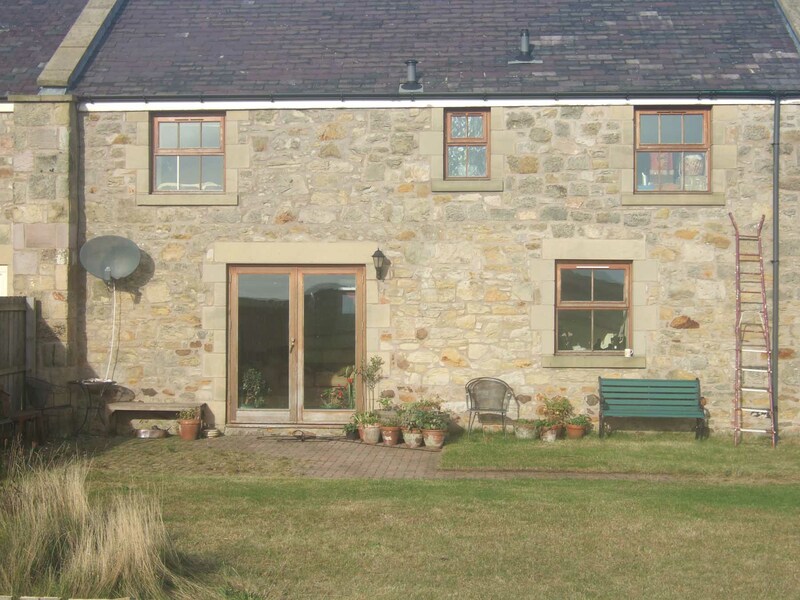 On the very far right of this picture, you can see a glimpse of the rose we planted when Stephen and I married here (alas, I have lost its name – such a pity). 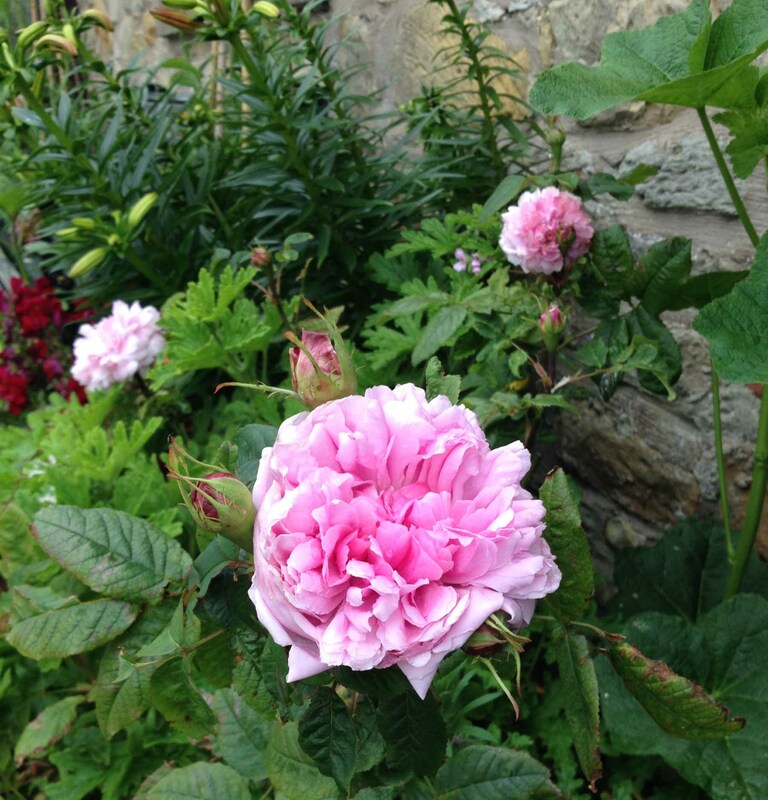 Here is the cutting of that self-same rose, blooming in our garden at Seaview. (Bit of a cheat this picture because it is heavily in bud right now, but not actually in bloom, so I have borrowed a pic from last year to show you this beautiful rose.) All these plants reminding me of other gardens, other places, other times that I have enjoyed. In addition there are a whole host of other plants that have come from friends and family. 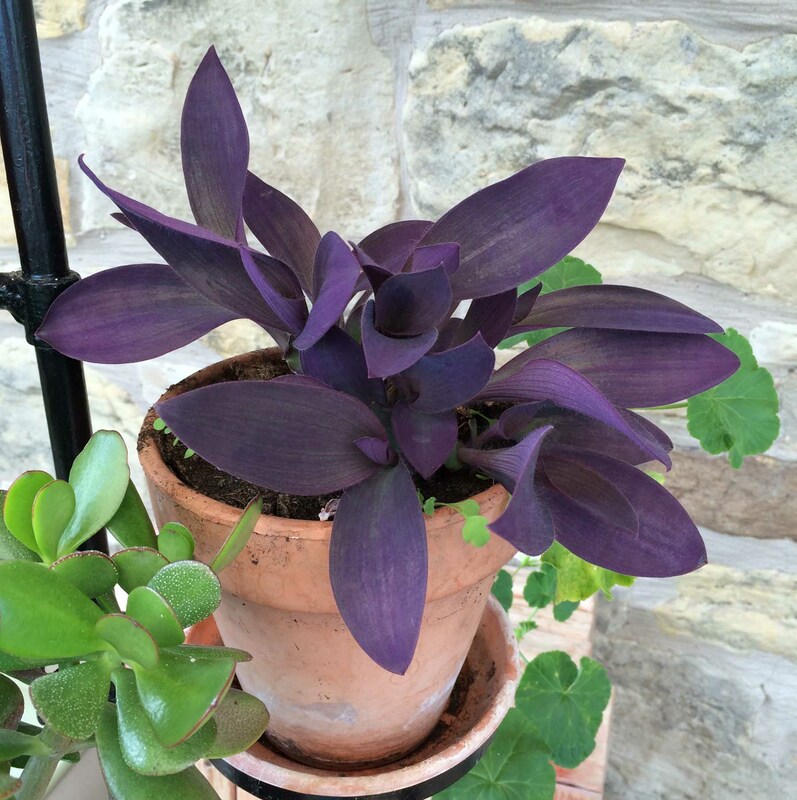 There’s a purple houseplant that was given to Stephen as a cutting some 30 years ago. Such an amazing colour. 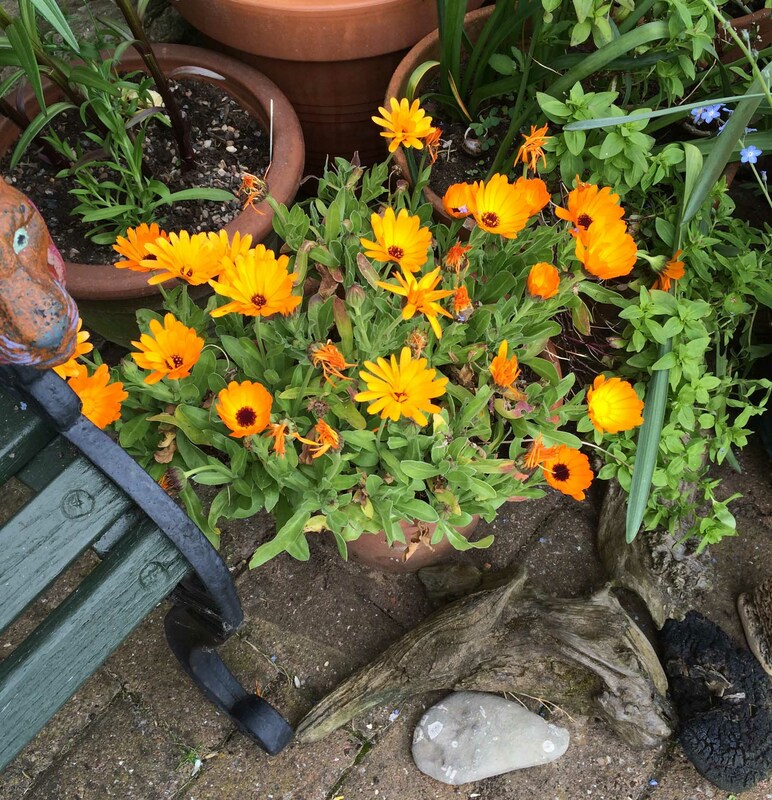 This gorgeous pot of marigolds grew from a handful of seeds I picked in my cousin Polly’s garden last summer. They have been a constant delight, remarkably flowering in this pot right through the autumn, winter and spring. Is is a family thing, I wonder, this wish to pass on plants from family gardens? Polly’s lovely Cambridge garden had its own tally of traveling plants. This fine yew tree grew from a cutting her father took in his Somerset garden. And here is the Ancestral Box, no less! Her American mother, brought it back as a cutting from her ancestors’ lands in Virginia. Of course, passing on plants is an economy too. A kind Devon friend gave me 6 raspberry runners from his garden when we first moved here. We were so cash-strapped, and so grateful! We discovered that raspberries grew so well here that I supplemented our raspberry bed with other varieties. My Aunty Jilly in nearby Edinburgh has been so very generous with seeds, roots, and cuttings from her garden. 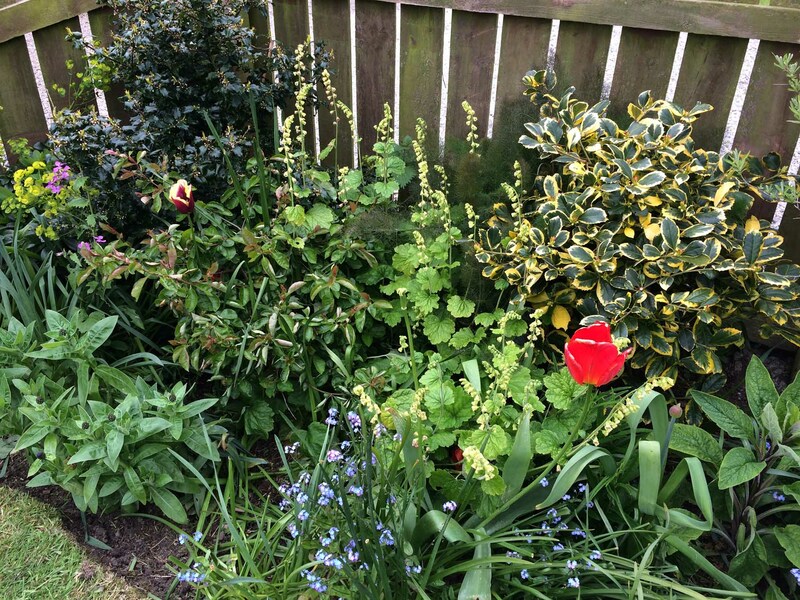 There’s a Holly seedling from her garden in this bed, those elegant tall cream flowers in the centre of the picture also came from her garden (don’t know their name – can anybody help me out? ), as did the Centaurea in the bottom left of the picture (not yet in flower). We pass plants back to her too. Here are the sweet pea pots we have prepared as a gift for my aunt’s 90th birthday next month! Plants have come here as birthday presents too. Our apple tree was just such a gift to me from my parents. There are certain plants in my garden that give me particular pleasure because they have such strong associations with my late father. 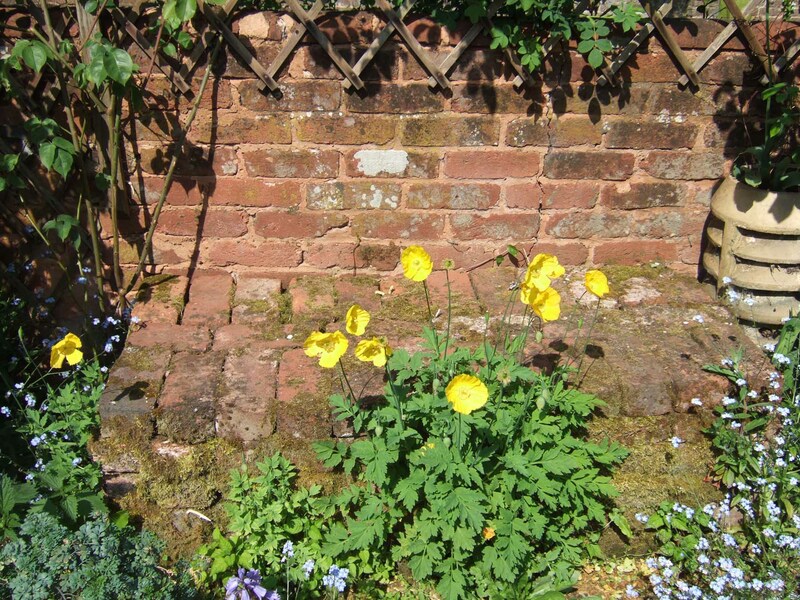 He loved to grow these little yellow Welsh poppies which have snuck into their courtyard garden at Wells in Somerset. I grew them in our Crediton garden in Devon. And I am so delighted that they are beginning to self-seed here too. 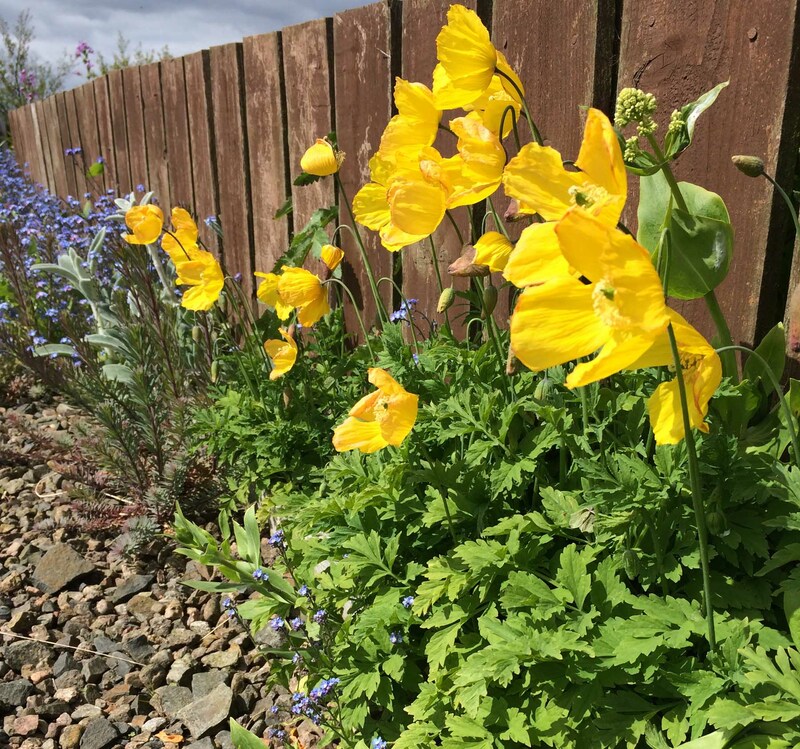 Many would call them weeds, but I love them and encourage them to grow, especially on the edges of plants and walls, where the soil is dry and poor (just what my father used to do). I come from a family of enthusiastic gardeners, but it is my father’s gardening choices that have influenced me most. Morning glory, cosmos, sunflowers – these are all plants we have grown/try to grow/ would like to grow, and all plants he grew most successfully. He also grew geraniums. There were always pots of geraniums in the summer months at the front door of my parents’ houses. 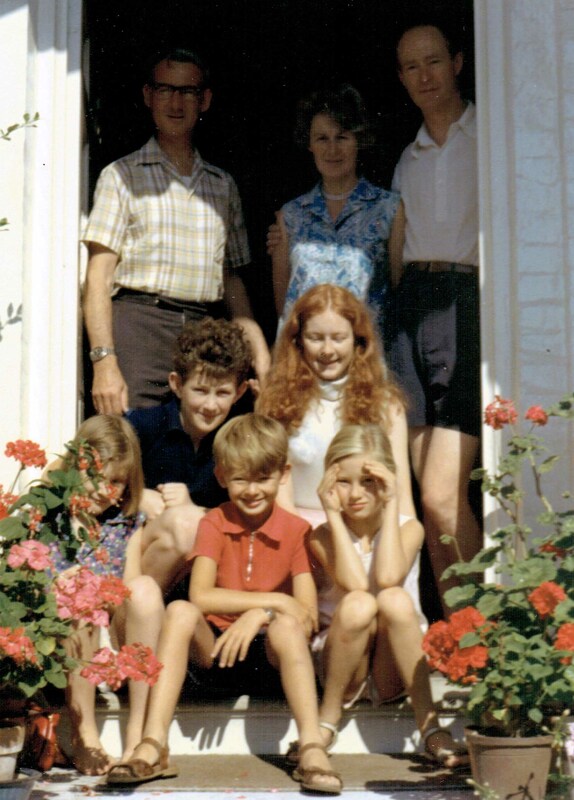 Here we are outside our Farningham home in 1978 with my American cousins. Amid the geraniums. 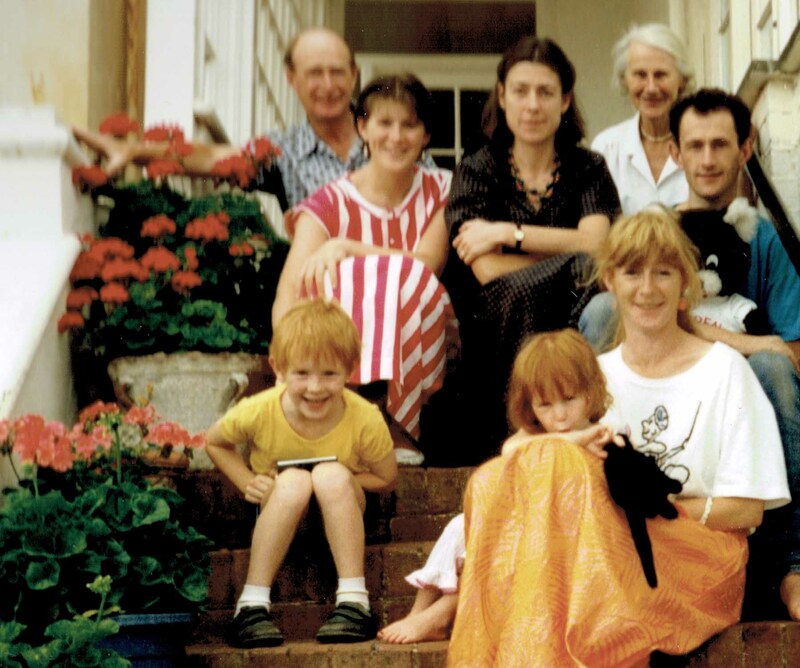 Later, they moved to Budleigh Salterton, and again, here we are – this time in 1987 – beside the geraniums! 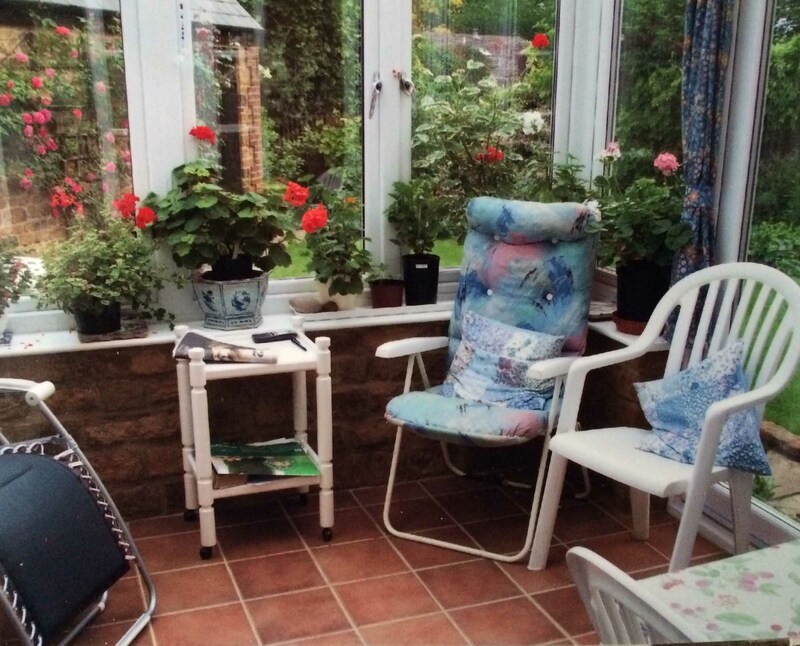 There were geraniums too in the conservatory of their house at Wells. 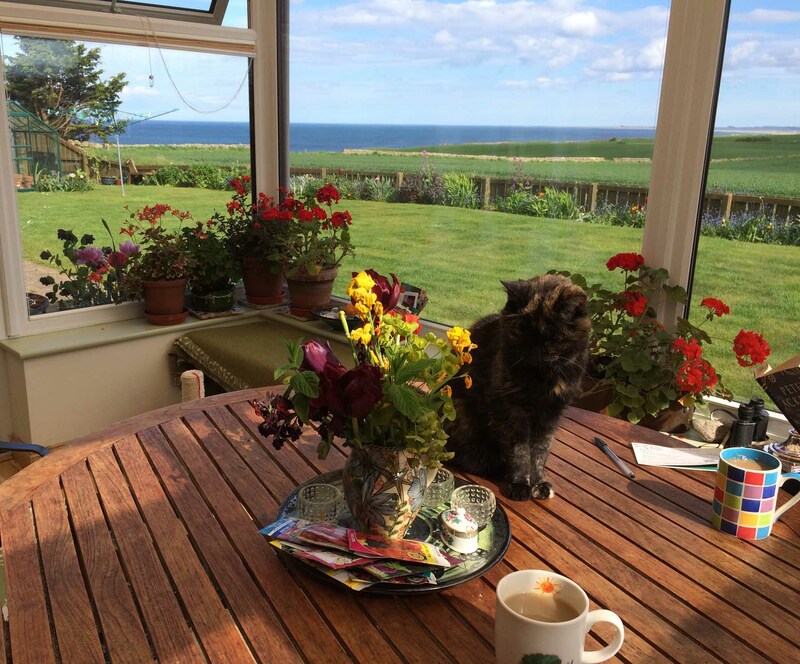 No prizes for guessing that what flourishes most beautifully and strikingly – and preciously to me – in the conservatory of our Seaview home are geraniums. Preferably scarlet or hot fuchsia. 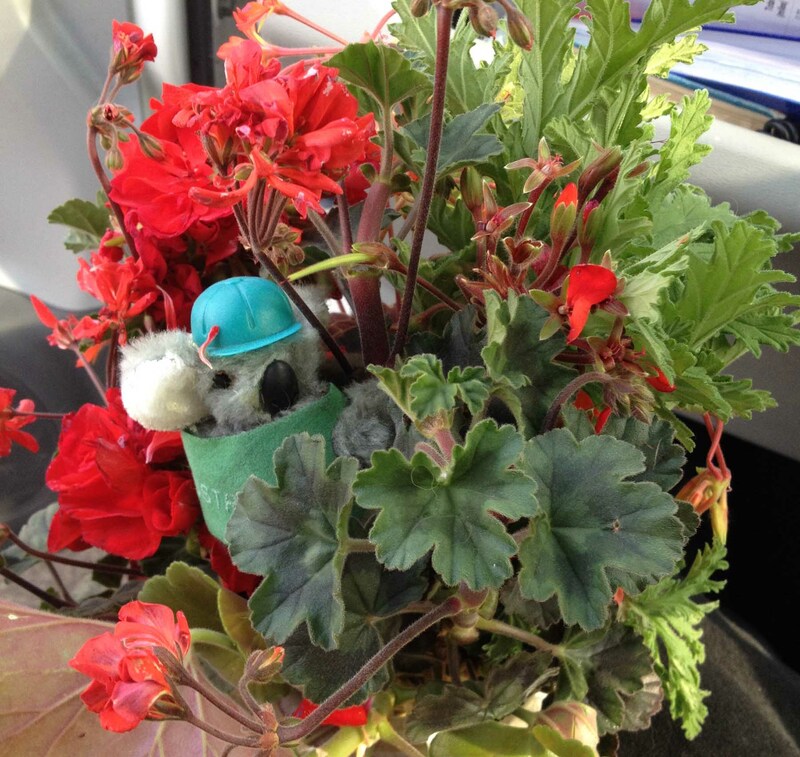 When it came to his funeral last year, it was natural to make a posy of geraniums to sit on his coffin. The dark-leaved geranium is one I particularly remember him growing. 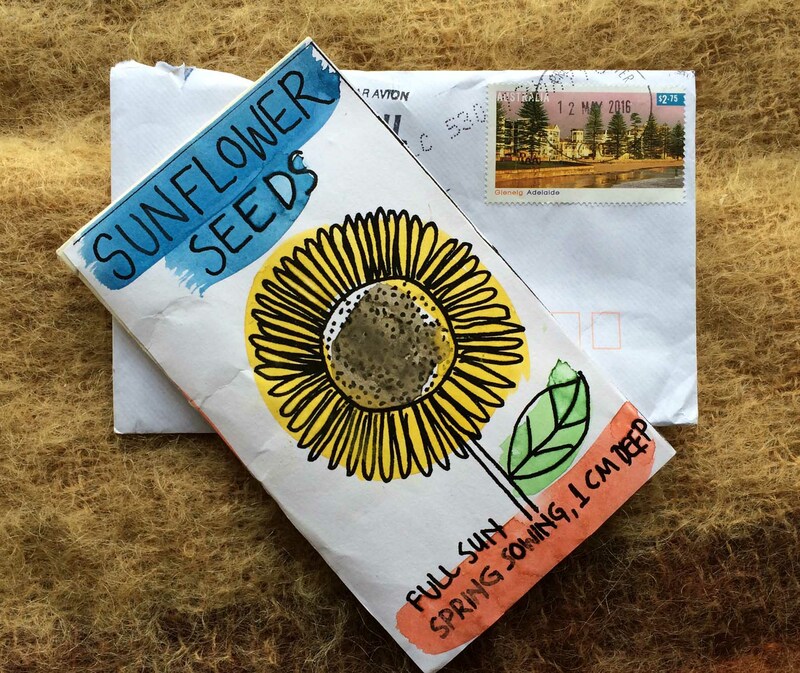 Just as I was mulling over my ideas for this blogpost, what was to arrive from Rebecca in Melbourne but a little bit of Australian sunshine – a packet of her sunflower seeds! Do you remember her writing about packaging sunflower seeds in her Needle and Spindle blog? How extraordinarily opportune that they should arrive so perfectly to illustrate my own blog on the pleasure of gifted plants! Thank you so very much, Rebecca! Thank you – and yes, it is the quite ordinary plants that can be most treasured, isn’t it? Gorgeous day here now – hope it’s countrywide 🙂 – and I’m just off to plant some sunflower seeds! The best kind of memories. I brought snowdrops and bluebells with me when we moved and have given countless ones since to family and friends. My Dad gave us a wisteria when the old one died. It’s just come into bloom. The rose arch and roses were bought as gifts for us. For my husbands birthday when he was 50 I gave him a mock orange which his Mum loved . I have just taken some of my bluebells to my Dads grave. Gardening is a wonderful link to the past. And I grow red geraniums just like my most beloved Granny. Thank you for this beautiful post. Thank you – and lovely to hear your stories of treasured plants too! I had you in mind and the snowdrops from your Dad’s garden when I wrote this post 🙂 Such simple plants, so treasured because of their links to our dear ones. 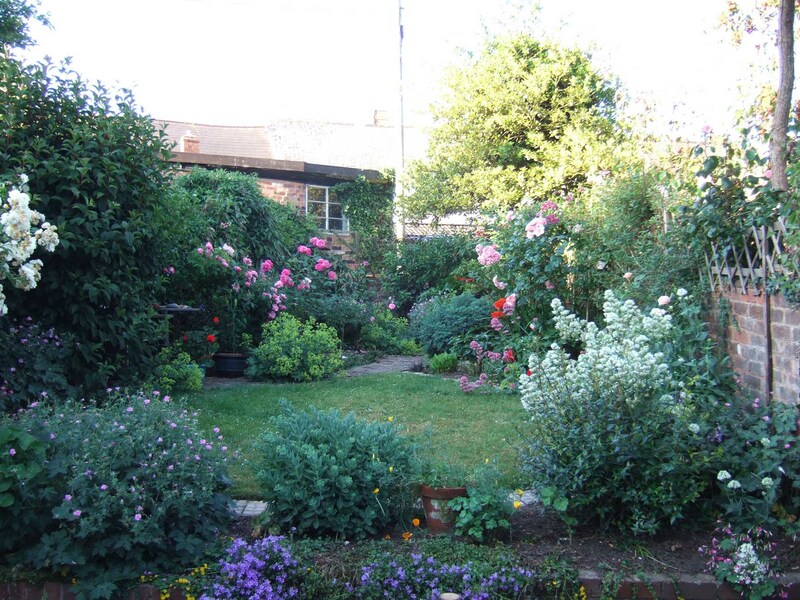 You have such a beautiful garden and definitely are in possession of green fingers. I love gardens, but do not yet have one of my own. I fear I probably don’t have green fingers anyway, but I still dream of a little veg plot and lovely little garden space. What a beautiful post and what serendipity for our humble sunflower seeds. 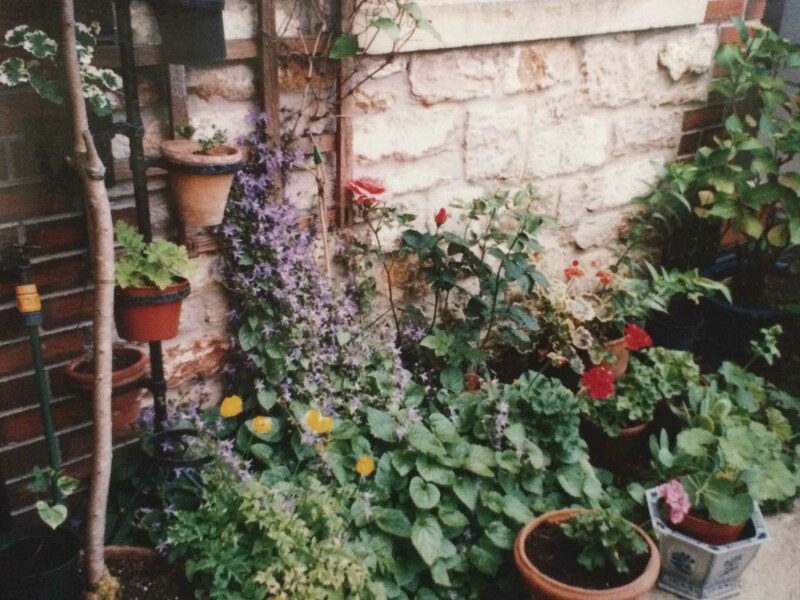 This archeology of your current garden reveals the way in which the material (in this case botanical) richness and beauty of our dwellings are formed through layers of friendship, kinship and memory. Our present would seem to be integrally linked to our past and to our social relations. I must ponder the origins of my own garden now! Thank you, Rebecca – your sunflower perfectly make the point. 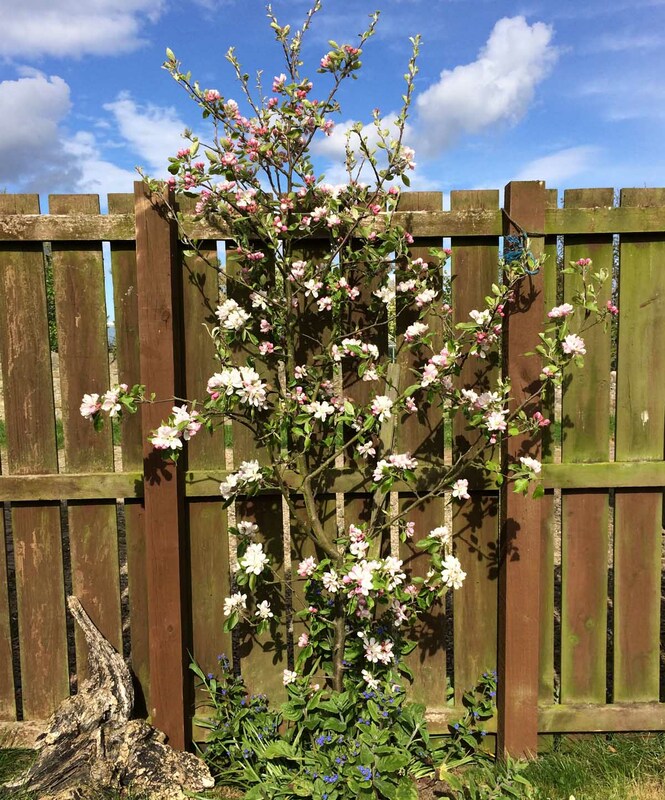 Just humble ordinary plants (as were all the other plants I mentioned in this blogpost) but invested with beauty because of the personal contacts. Actually I think sunflowers are intrinsically beautiful without the human overlay – and I’m sure Stephen would have something to add about the natural mathematics of the flower! I wonder what you will see in your own garden plants now?! Keep your hands dirty…in the DIRT!! Thank you again kd for such a beautiful and interesting post, you never fail to inspire. This one brought back memories of bleeding heart and raspberries in my grandparents’ garden and how much my dad used to love his roses. Our garden is mostly shady, and a bit of a hodgepodge, but we love it just the same. Lovely to hear that you too have treasured family-association plants, Karen. And a treasured hodgepodge of a garden can be deeply special. I do have to tell you that lots of people think my garden strange – because they believe many of these ordinary plants I grow (actually encourage to flourish 🙂 ) are weeds – haha! Beauty and love are definitely in the eye of the beholder! !